Background and objectives: Hemolytic uremic syndrome (HUS) is characterized by microangiopathic hemolytic anemia, thrombocytopenia, and renal impairment. Most childhood cases are caused by Shiga toxin–producing bacteria. The other form, atypical HUS (aHUS), accounts for 10% of cases and has a poor prognosis. Genetic complement abnormalities have been found in aHUS. Design, setting, participants, and measurements: We screened 273 consecutive patients with aHUS for complement abnormalities and studied their role in predicting clinical phenotype and response to treatment. We compared mutation frequencies and localization and clinical outcome in familial (82) and sporadic (191) cases. Results: In >70% of sporadic and familial cases, gene mutations, disease-associated factor H (CFH) polymorphisms, or anti-CFH autoantibodies were found. Either mutations or CFH polymorphisms were also found in the majority of patients with secondary aHUS, suggesting a genetic predisposition. Familial cases showed a higher prevalence of mutations in SCR20 of CFH and more severe disease than sporadic cases. Patients with CFH or THBD (thrombomodulin) mutations had the earliest onset and highest mortality. 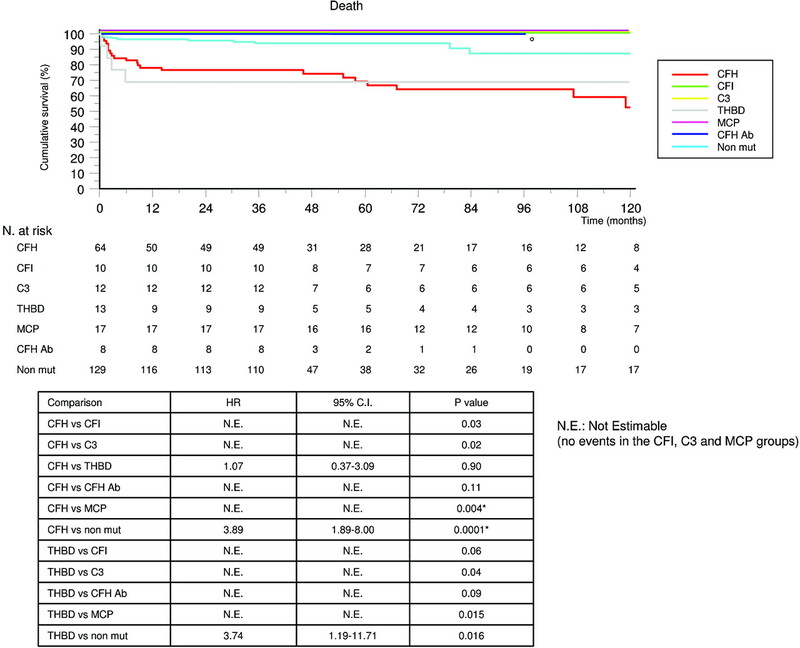 Membrane-cofactor protein (MCP) mutations were associated with the best prognosis. Plasma therapy induced remission in 55 to 80% of episodes in patients with CFH, C3, or THBD mutations or autoantibodies, whereas patients with CFI (factor I) mutations were poor responders. aHUS recurred frequently after kidney transplantation except for patients with MCP mutations. Conclusions: Results underline the need of genetic screening for all susceptibility factors as part of clinical management of aHUS and for identification of patients who could safely benefit from kidney transplant. Hemolytic uremic syndrome (HUS) is a disorder of the microvasculature with hemolytic anemia, thrombocytopenia, and acute renal failure (1). Most childhood cases are caused by E. coli strains producing Shiga-like toxins (Stx-E. coli) (2,3). However, ∼10% of cases are not caused by Stx-E. coli (4). This atypical form (aHUS) can be sporadic or familial (4,5) and has a poor prognosis, with a 10 to 15% mortality rate during the acute phase (6) and up to 50% of cases progressing to end-stage renal failure (ESRF). Extensive research has established an association between aHUS and uncontrolled activation of the alternative pathway of the complement system (4). More than 120 mutations in CFH, CFI, and MCP, encoding the regulatory proteins complement factor H, factor I, and membrane-cofactor protein, respectively, have been reported in patients with aHUS (www.FH-HUS.org). Gain-of-function mutations in key proteins of the alternative pathway, complement factor B (CFB), and C3 have also been reported (7–9). More recently, mutations in THBD encoding thrombomodulin, a membrane-bound glycoprotein with anticoagulant properties that modulates complement activation on cell surfaces, have also been associated with aHUS (10). Finally, anti-CFH autoantibodies have been described in sporadic forms (11). Of note, 90% of patients with anti-CFH autoantibodies have complete deficiency of factor H–related proteins (CFHR) 1 and 3 secondary to deletion of the CFHR1 and CFHR3 genes (12,13), suggesting a pathogenetic link between CFHR1/CFHR3 deletion and anti-CFH autoantibodies. Novel genetic abnormalities of CFHR1, CFHR3, and CFHR1-CFHR4A have recently been reported (14). Published genetic abnormalities (5,15–17) account for ∼70% of familial forms and have been also found in sporadic aHUS, mainly in idiopathic, but also in few secondary forms (4,18). In this study, we performed genetic screening for aHUS susceptibility factors in a large cohort of patients to (1) evaluate the prevalence of known genetic complement abnormalities in sporadic and familial aHUS, (2) compare the prevalence and distribution of mutations in sporadic and familial cases, (3) examine genotype–phenotype correlations with regard to response to plasma treatment, short- and long-term outcomes, and outcome of kidney transplantation, and (4) compare sporadic versus familial cases and childhood versus adult cases for the above clinical parameters. Diagnosis of aHUS was done as described (15) (see Supplementary Material). Two hundred seventy-three patients who had been registered consecutively from 1996 to 2007 within the International Registry of Recurrent and Familial HUS/TTP were recruited: 58% from Italy, 15% from other European countries, 14% from North America, 2% from South America, 2% from Africa, 1% from Asia, and 8% from the Middle East. One hundred ninety-one were classified as sporadic and 82 as familial (31 families; 2 to 11 affected subjects/family). Among sporadic cases, 144 were idiopathic, and the others had secondary forms (Table 1). Available relatives of patients with mutations were screened to establish disease penetrance. An appropriate panel of healthy controls was also screened (Supplementary Material). All participants provided informed written consent. The protocol was approved by the Ethics Committee of the Azienda Sanitaria Locale, Bergamo, Italy. Genomic DNA was extracted from blood leukocytes (BACC2 kit; Nucleon, Amersham, UK). The coding sequence and the intronic flanking regions were directly sequenced (AB-3130-XL sequencer). Each sequence variant found in aHUS patients was searched for in healthy controls. Screening for CFH/CFHR1 rearrangements was performed as described (19), and the presence of a CFH/CFHR1 hybrid gene was confirmed by long PCR with a CFH specific forward primer (in exon 20) and a CFH/CFHR1 common reverse primer (in exon 23), followed by sequencing using the reverse primer. CFH autoantibodies were evaluated by ELISA (11,12,20). CFHR1-3 deletion was detected by Western blotting (12). C3 and C4 serum levels were evaluated by kinetic nephelometry; CFH levels were measured by radial immunodiffusion assay (The Binding Site). Differences in clinical and biochemical data among patients with or without mutations, patients with familial and sporadic forms, and patients with childhood and adulthood onset were analyzed by χ2 or Fisher tests with Bonferroni's correction for multiple comparisons. The frequencies of CFH genotypes in aHUS patients and controls were compared by the χ2 test. Cumulative fractions of patient-free of events (defined as the combination of ESRF or death, whichever occurred first after the onset of HUS, or the occurrence of death alone) were estimated by Kaplan-Meier analyses. P values for differences between groups were calculated by the log-rank test, and, when feasible, unadjusted Cox proportional hazards regression models were used to calculate hazard ratios and the corresponding 95% confidence intervals. Differences were considered statistically significant at P < 0. 05 after Bonferroni's correction for multiple comparisons. The entire coding region of CFH, CFI, MCP, and THBD (10) were sequenced in 273 consecutive patients with aHUS. Results of genetic screening in CFH, MCP, and CFI in the first 156 patients have been previously published (15). For all genes, the mutation rate was higher in familial versus sporadic cases. Sixty-two patients, all whites, carried single CFH mutations (mutation rate: overall, 23%; sporadic, 16%; familial, 40%; Figure 1A; Table 1). All mutations were heterozygous, with the exception of a homozygous Y899X in a sporadic patient and a homozygous 3675–3699del in 10 patients from a consanguineous Bedouin family. All mutational events but one (causing protein interruption in short-consensus-repeat [SCR]8) in familial cases were located in SCR20 versus 60% of those in sporadic cases. Summary of CFH (A), CFI (B), C3 (C), CFB (D), MCP (E), and THBD (F) variants and of combined mutations (G) in aHUS patients from the International Registry of Recurrent and Familial HUS/TTP. Already published mutations are reported in black; new mutations are in red; and polymorphisms are in green (newly described polymorphisms are in italic). Mutations found only in familial aHUS patients are in dark gray squares, those found both in familial and sporadic cases are in gray squares, and mutations found only in sporadic cases are in light gray squares. A, B, E, and F include also mutational events in patients with combined mutations. (A) CFH: 69% of the overall independent mutations in CFH cluster in the C terminus short consensus repeat (SCR) 20. Another cluster of mutations is located in SCRs 15 to 16 (15.5%). Six mutations resulted in truncated proteins at SCR8 (n = 1), SCR15 (n = 1), SCR17 (n = 1), and SCR20 (n = 3). The aHUS-associated polymorphism in SCR16 (E936D) is marked in green. To complete CFH genetic analysis, we also screened exon 10, which produces factor H-like 1, a splice variant containing the first eight SCRs of CFH, including the complement regulatory domain. No mutations and/or polymorphisms were found. (B) CFI: 6 mutations (58%) cluster in the serine-protease domain of CFI. Of note, the intronic change 1534 + 5 G>T that was previously reported by us as a HUS-associated mutation (15) is indicated in the figure as a polymorphism because, in this report, we found this variant in a healthy control. (C) C3: the mutations are spread all over the gene; however, a hot spot is evidenced in the thioester-containing domain (TED domain) with five independent mutations (42%). (D) CFB: only one heterozygous mutation (in SCR2) has been found. Eight polymorphic variants were identified. (E) MCP: 17 independent mutations (94%) cluster in the four SCRs at the N terminus of MCP, and 55.5% are located within SCR1, confirming the importance of this region for complement regulation. The R59X and C35Y mutations were identified four and three times, respectively, suggesting that they may represent a mutational hot spot in MCP. A L139L sinonymous polymorphism has been found in MCP in a sporadic patient, but it was not found in healthy controls. This subject carries also a mutation in CFH. The amino acid syntax of MCP that takes into account the signal peptide has been adopted. (F) THBD: three independent mutational events cluster in the lectin-like domain and six cluster in the serine threonine rich (ST-rich) peptide. (G) Diagram showing the number of patients with single or combined mutations from the International Registry of Recurrent and Familial HUS/TTP is reported. Numbers of patients with mutations in CFH, MCP, CFI, and THBD alone are shown in the circles. The numbers of patients carrying combined mutations are shown in the overlapping areas; the amino acid changes are reported in the corresponding boxes. In four nonconsanguineous patients of African origin, six CFH variants were found, which were also detected in African controls (n = 11) but not in white controls, indicating that the CFH genotype is ethnicity specific. The association of the T variant of the promoter polymorphism C-257T (rs3753394) and the D variant of the E936D polymorphism (G2808T, rs1065489) (21) with aHUS was also studied. First, only aHUS patients with white ethnicity (n = 245) were compared with white controls (n = 200). Both polymorphisms were strongly associated with aHUS (carriers frequencies C-257T, TT/CT: 0.65 aHUS, 0.44 controls, P < 0.0001; E936D, ED/DD: 0.51 aHUS, 0.33 controls, P = 0.003; allele frequencies −257T: 0.42 aHUS, 0.26 controls; 936D: 0.32 aHUS, 0.17 controls). We then also included nonwhite patients, with identical results (C-257T: P < 0.0001, E936D: P = 0.003). CFH autoantibodies were screened in 149 patients for whom serum was available and were detected in 10 idiopathic sporadic patients: 8 without mutations (4%) and 2 with CFH mutations (Table 1). In all but one patient, CFH autoantibodies were associated with CFHR1-3 deletion (12). Ten white patients carried single CFI mutations (overall: 4%, sporadic: 3%, familial: 5%; Figure 1B; Table 1), all heterozygous. Eighteen white patients carried single MCP mutations (overall: 7%, sporadic: 7%, familial: 6%; Figure 1E; Table 1); all but two were heterozygous (15), and 90% clustered in the four extracellular SCRs. Thirteen patients (12 whites and 1 Chinese) carried single heterozygous THBD mutations (overall: 5%, sporadic: 3%, familial: 9%; Figure 1F; Table 1). Nine additional white patients carried mutations in more than one gene (mutation rate: overall, 3%; sporadic, 2%; familial, 7%; Figure 1G; Table 1). All patients without mutations in the above genes were screened for C3 (n = 146). Twelve heterozygous C3 mutations were found in 12 white patients (8 sporadic and 4 familial; 1 patient carried 3 mutations; Figure 1C; Table 1); 3 of them had normal C3 serum levels (Table 2). Of 48 patients who did not have CFH, CFI, C3, MCP, or THBD mutations, 3 (from two families) carried a CFH/CFHR1 hybrid gene (12). CFB and other candidate genes involved in complement pathway were also analyzed (details on selection criteria and results are in Supplementary Material, Table 1, and Figure 1D), but the mutation rate was very low. Mutations or anti-CFH autoantibodies were identified in 139 of 273 patients (overall, 51%; sporadic, 41%; familial, 74%; Table 1). Among sporadic cases, abnormalities were found in 45% of idiopathic forms and 14 to 44% of secondary forms (Table 1). Genetic analysis in relatives of 22 sporadic patients showed that, in 21 cases, the mutation was inherited from an unaffected parent, whereas in 1, the mutation (in CFH) was de novo. All mutations but one were found in white patients and were not found in a panel of 120 European and U.S. white controls. In 58% of patients with sporadic aHUS and neither mutations nor antibodies, we found the CFH-257T and/or 936D variants that have been associated with aHUS (21) (Supplemental Table 1). Thus, 75% of patients with sporadic aHUS have mutations or anti-CFH antibodies or carry disease-associated CFH polymorphisms. Analysis of relatives of sporadic and familial cases showed an incomplete penetrance (CFH, 48%; CFI, 50%; C3, 56%; THBD, 64%; MCP, 53%). The disease became manifest mostly in childhood (≤18 years), with the exception of patients carrying CFI and C3 mutations (Table 2). The earliest onset (0 to 1 years) was in patients with CFH or THBD mutations or CFH autoantibodies (Supplemental Figure 1). However, in 12 to 50% of subjects, the disease occurred after the age of 25 years (up to 83 years; Supplemental Figure 2). Triggering/underlying conditions were found in 70% of patients. Diarrhea and/or gastroenteritis and upper respiratory tract infections were frequent triggers (Table 2). Malignant hypertension either triggered or complicated the disease in 17 patients. Pregnancy-related aHUS was reported in 13 patients; 11 had de novo post-transplant aHUS, and 9 had other glomerulopathies (Table 2; Supplemental Table 2). Extrarenal involvement during HUS episodes was observed in 10 to 30% of patients, with the exception of patients with MCP mutations (Table 2). Low C3 levels were reported more frequently in patients with mutations in CFH or C3 than in patients without mutations. Forty to >70% of patients with CFH, CFI, C3, or THBD mutations or anti-CFH autoantibodies developed ESRF or died during the first episode or within 3 years from onset (Table 3). CFH mutations affecting the C-terminal SCR20 (including the CFH-CFHR1 hybrid gene) were associated with worse short- and long-term prognosis than those affecting SCRs 1 to 19 (Supplemental Figure 3). Complete or partial remission was the outcome of the presenting episode in patients with MCP mutations (Table 3). These patients had recurrences more frequently than patients with either CFI mutations or without mutations (Table 2). Despite this, data at 3 years confirmed a better outcome in patients with MCP mutations than the other groups (Table 3). Overall, sporadic cases had a better prognosis than familial ones (Table 4). Separate analyses of groups with specific abnormalities showed a statistically significant difference between sporadic and familial cases within the CFH-mutated group (Table 3), possibly because of a higher prevalence of mutations in SCR20 in familial cases (Figure 1A). Combining sporadic and familial cases, adults had a worse prognosis than children (Table 4; Supplemental Table 3). Figure 2 shows Kaplan-Meier curves and hazard ratios for event-free survival (ESRF or death) during follow-up and confirms the best outcome for patients with MCP mutations. The fraction of patients still alive at any time point during follow-up is shown in Figure 3. Overall survival was worse for patients with CFH and THBD mutations than the other groups. Cumulative Kaplan-Meier estimates of the rates of first event (ESRF or death). The fractions of patients free of ESRF or still alive at any time point according to the presence of mutations in CFH, CFI, C3, THBD, MCP, or CFH autoantibodies or without mutations (Non mut) are shown. The MCP group was chosen as the reference group. Hazard ratios and 95% confidence intervals calculated using the Cox proportional hazards regression model are shown. P values were calculated using the log-rank test. The comparisons that were statistically significant after Bonferroni correction are shown in the table. °Follow-up < 120 months. Cumulative Kaplan-Meier estimates of the rates of death. Fractions of patients still alive at any time point according to the presence of mutations in CFH, CFI, C3, THBD, MCP, or CFH autoantibodies or without mutations (Non mut) are shown. The CFH and THBD groups were chosen as reference groups. When feasible, hazard ratios and 95% confidence intervals were calculated by means of Cox proportional hazards regression model and shown in the figure. P values were calculated by means of the log-rank test after Bonferroni's correction. The most relevant comparisons are shown in the table. *Statistically significant after Bonferroni correction. °Follow-up < 120 months. Plasma treatment induced complete or partial remission of 63, 25, 57, 88, and 75% of episodes in patients with CFH, CFI, C3, THBD mutations or anti-CFH autoantibodies, respectively (Tables 4 and 5). There was no difference in response to plasma infusion (complete or partial remission in 64% of episodes) versus plasma exchange (62%). Three patients with anti-CFH autoantibodies were given steroids together with plasma, and remission was achieved in two. Patients with MCP mutations underwent remission in 97% of plasma-treated episodes (Tables 4 and 5) but also in all of the 14 episodes not treated with plasma. Overall, ∼70% of episodes (50% of patients) responded to plasma without differences between sporadic and familial cases. A better response to plasma treatment was observed in children than in adults (Table 4). Transplantation outcomes in patients with CFH mutations were poor: 12 of 17 kidney grafts were lost for aHUS recurrence, acute rejection, or thrombosis within 1 year (Figure 4). Of the five patients with good graft outcome, three received intensive plasma prophylaxis. aHUS recurrence occurred within the first year in four out of six grafts in patients with CFI mutations. Simultaneous kidney and liver transplant was performed in four children with CFH mutations and in a child with combined CFH/CFI mutations. Three patients with CFH mutations died: two within a few days because of severe thrombotic liver complications (22,23) and one after 4 years because of hepatic encephalopathy (24). The other two patients have preserved liver and kidney function 1 year after transplantation. Outcome of kidney transplantation. The outcome at 1 year of 64 transplanted kidneys in genotyped patients of the International Registry of HUS/TTP is reported, according to the absence or presence of a mutation. Plasma prophylaxis was used in three patients with CFH mutation, in one patient with C3 mutation, and in one patient with CFI mutation (*), all with good outcomes. Plasma was given to treat aHUS recurrences in 20 grafts. Remission was achieved in only three (°). The numbers of transplanted organs are shown above each column. Seven kidneys were transplanted in four patients with C3 mutations; recurrence manifested in three grafts, of which two were lost, whereas the third recovered after four plasma exchanges. One patient with THBD mutation and one with CFH autoantibodies lost the kidney graft for recurrence. Kidney transplant was performed in three patients with MCP mutations; all have good graft function at 13, 3, and 2 years after transplantation. In patients without mutations or autoantibodies, 59% of the grafts were lost within 1 year. Overall, a good graft outcome was observed in 46% of sporadic and 30% of familial cases (Table 4). No difference in graft outcome was observed between children and adults (Table 4). This study showed that a genetic predisposition accounts for the majority of sporadic forms of aHUS and provides a detailed description of both known and new mutations and polymorphisms involved in sporadic and familial aHUS. Disease onset was generally preceded by a trigger, showing that both genetic predisposition and a precipitating event are required for the development of sporadic and familial aHUS. Finally, we provided data showing that clinical phenotype, response to treatment, and long-term outcome, including outcome after kidney transplantation, are predicted by individual gene abnormalities. Complement gene abnormalities have been previously reported in sporadic aHUS (15,18). Here we showed that genetic abnormalities or anti-CFH autoantibodies are present in a substantial proportion of patients with sporadic idiopathic aHUS. In most patients, anti-CFH autoantibodies were associated with CFHR1-3 deletion, confirming published data (12,25). Interestingly, we found genetic abnormalities—mainly in CFH—also in patients with pregnancy-associated aHUS, post-transplant aHUS, and other systemic or renal diseases, whereas no patients with secondary aHUS had anti-CFH autoantibodies. In addition, the majority of patients with secondary forms carried one or two polymorphic variants in CFH that have been shown to predispose to aHUS (21 and present data). Altogether, these findings provide evidence that secondary forms of sporadic aHUS are genetically determined and indicate that genetic screening—at least in CFH—should be performed also in these cases. An important observation in our study is that serum C3 levels were normal in three sporadic aHUS patients with C3 mutations. In published series, C3 mutation screening was limited to patients with low C3 levels (8,26); our data suggest that it should be performed in all patients. Five percent of patients carried mutations in the very recently discovered HUS-associated gene THBD (10), one in combination with a CFH mutation. Of note, cells expressing the aHUS-associated THBD variants have diminished capacity to inactivate C3b (10). This finding documents a functional link between complement and coagulation, opening new perspectives for candidate gene research in aHUS. We confirmed that mutations in CFB are rare in aHUS (5,7,9); including the one described here, only five mutations have been reported. In ∼26% of familial cases, we could not identify any mutation. Therefore, the search for new gene abnormalities should continue. In the majority of patients, the disease became manifest during infancy. However, age of onset showed a large range, even within the same family. Moreover, we found unaffected carriers among relatives of both familial and sporadic cases, which confirms previous findings (5,15,27) that mutations in complement genes are predisposing rather than directly causal. Indeed, in 70% of patients, aHUS onset was associated with a triggering/underlying condition. Viral or bacterial infections triggered disease in young children (<10 years). A second peak of onset was observed at ∼25 to 40 years of age, often in association with pregnancy, a condition of complement activation (28). Four percent of patients developed de novo HUS after transplantation (18). Alternative pathway activation in these circumstances can mainly be attributed to ischemia/reperfusion injury (29). In ∼3% of cases, aHUS was diagnosed in patients with other renal diseases. The most common was membranoproliferative glomerulonephritis (MPGN), diagnosed in five patients, four of them carrying mutations in complement genes (Supplemental Table 2). 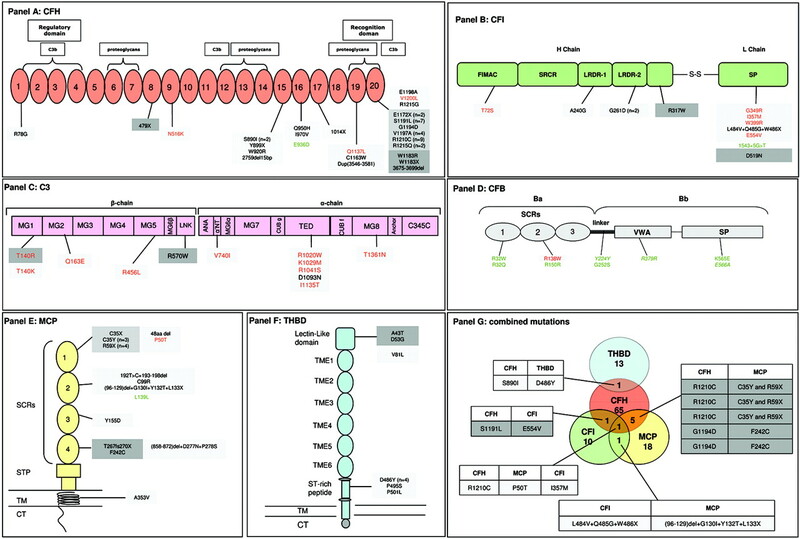 Genetically determined dysregulation of the alternative pathway of complement plays a role in MPGN, and mutations in CFH, CFI, and MCP have been reported in patients with type I and type II MPGN (30). In addition, cases have been described where biopsies first suggested MPGN, and in a later phase aHUS, or vice versa (31). These findings suggest a close pathogenetic link between aHUS and MPGN. 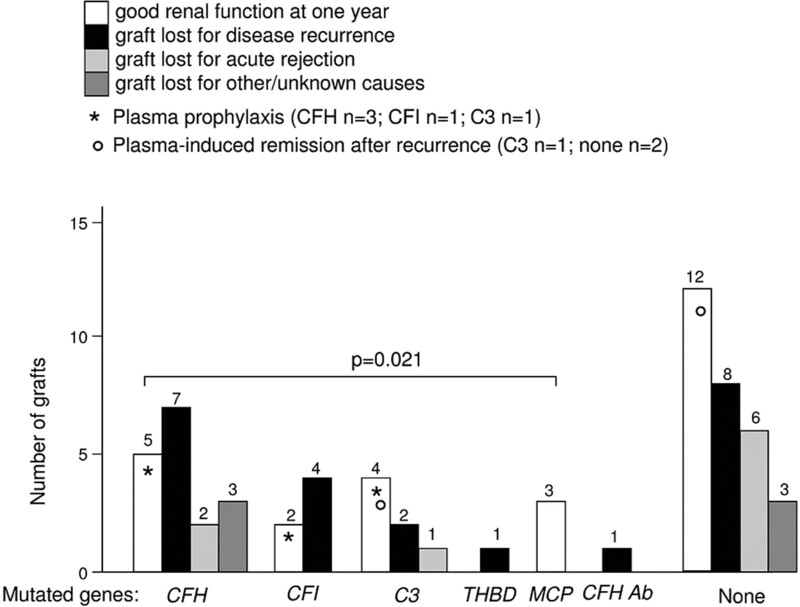 The majority of patients with CFH, CFI, C3, and THBD mutations or anti-CFH autoantibodies lost renal function or died during the presenting episode or progressed to ESRF as a consequence of relapses. Finding that patients with mutations in the C-terminal region of CFH had increased mortality and higher incidence of ESRF than patients with mutations in other regions of CFH emphasizes the pivotal role of the CFH C terminus in protecting endothelial cells from complement attack (32). Of note, all CFH mutations in familial cases caused either alteration or loss of the C terminus, whereas CFH mutations in sporadic cases were more broadly distributed, which could explain the better outcome in sporadic versus familial cases. MCP mutation carriers had a good prognosis, which is consistent with previously published data (15,27). Recurrences were very frequent, but their effect on outcome was mild, with 90% of patients remaining alive and dialysis free in the long term. Of relevance, patients with CFH or THBD mutations had a higher mortality rate than other patients. Patients with CFH mutations had a higher incidence of cardiovascular disease (CVD) (Table 2), which may partly be explained by the higher percentage of patients on dialysis, but a causal link between chronic complement activation and CVD has also been suggested (33). Plasma exchange and plasma infusion are considered first-line therapies in aHUS (1,27,34), but the reported clinical response varies from complete remission to no response and immediate ESRF, depending on the underlying genetic defect (15,27). Plasma treatment could theoretically be beneficial in patients with mutations in circulating complement regulators (27). This hypothesis is supported by the finding that, in our patients with CFH mutations, complete or partial remission was achieved in the majority of plasma-treated episodes. On the other hand, results were less favorable for patients with CFI mutations, despite the fact that CFI is a plasma complement regulatory protein as well. Data on treatment of patients with C3 mutations are scarce (8). Plasma treatment could remove mutant hyperactive C3 and also provide regulatory plasma proteins to counteract complement activation induced by mutant C3. In fact, in our series, response to plasma treatment in patients with C3 mutations was comparable to that of patients with CFH mutations. In patients with MCP mutations, plasma therapy did not affect outcome, which is consistent with the fact that MCP is not a circulating protein (35). Contrary to other reports (34,36), we found no difference in response to plasma infusion versus plasma exchange. The rationale behind using plasma exchange instead of infusion is that plasma exchange also removes mutant circulating molecules (37) and CFH autoantibodies and allows administration of higher volumes of plasma without the risk of fluid overload. Of note, results of response to plasma in patient subgroups and the comparison between plasma infusion/exchange are limited by the retrospective nature of our analyses and by different approaches to plasma treatment in different centers (including volume of plasma, delay between diagnosis, and treatment). Recent expert opinion papers (23,34) recommended, as a practical point, empiric plasma exchange in episodes of aHUS, since genetic information is usually not available when the patient is presenting with aHUS. These findings and previous data emphasize that kidney transplantation alone in aHUS is severely compromised by the risk of recurrence (27,38), especially in patients with CFH and CFI mutations and to a lesser degree in patients with C3 mutations. Because CFH, CFI, and C3 are plasma proteins synthesized predominantly by the liver, kidney transplantation alone does not correct the defect. As reported previously, simultaneous liver–kidney transplantation prevented recurrences in patients with CFH mutations but had a high mortality rate (23,24,39,40). Kidney graft outcome was favorable in patients with MCP mutations, none of whom had disease recurrence in the graft, as expected, considering that MCP is a transmembrane protein highly expressed in the kidney. Of note, two patients with THBD mutations developed HUS after kidney transplant (one de novo and one recurrence), which is unexpected, because thrombomodulin is an endothelial transmembrane protein like MCP. However, a soluble thrombomodulin form (sTM) circulates in plasma and possesses similar functional activities as membrane-bound thrombomodulin. Treatment with sTM attenuated ischemia–reperfusion renal injury in the rat (41). One could speculate that, because of dysfunctional sTM, in THBD-mutated recipients, the grafts were not sufficiently protected against complement activation and prothrombotic stimuli triggered by ischemia–reperfusion injury. Plasma prophylaxis has been proposed as a strategy to prevent disease recurrence (42,43). In our series, three patients with CFH mutations, one with a CFI mutation, and one with a C3 mutation received plasma prophylaxis after transplant and had no recurrence. However, these patients are plasma dependent, which calls for alternative, more specific strategies. In contrast, plasma was minimally effective at treating ongoing recurrences in transplanted patients with CFH, CFI, or C3 mutations, because remission was achieved in only 1 of 10 plasma-treated patients. Screening for all genetic aHUS susceptibility factors is a time-consuming procedure; however, results of this study emphasize the clinical importance of such screening, because patients on dialysis with single mutations in MCP would safely benefit from a kidney transplant. Finally, showing the complement abnormalities underlying aHUS opens perspectives for specific treatment of the disease with complement inhibitors. Eculizumab, a human anti-C5 monoclonal antibody, induced remission of aHUS in recent case reports (44–48) and could represent the future for treatment of acute episodes and prevention of recurrences in the graft. This work was supported by grants from Comitato Telethon Fondazione ONLUS (Roma, Italy) Project GGP07193, Compagnia di San Paolo (Torino, Italy), Fondazione ART per la Ricerca sui Trapianti ONLUS (Milan, Italy), Istituto Superiore di Sanità (Rome, Italy), Fondazione ARMR Onlus Aiuti per la Ricerca sulle Malattie Rare (Bergamo, Italy), Progetto Alice ONLUS (Milan, Italy), and the UK Medical Research Council (Grant G0701325 to T.H.J.G.). C. Mossali received a fellowship from Fondazione Chiesi (Parma, Italy) and R. Piras received a fellowship from Regione Sardegna. We thank M. A. Dragon-Durey for CFH autoantibodies evaluation in a subgroup of patients, M. Cugno for C1-inh assays, A. Perna for support in statistical analyses, and Monica Lena for the management of biologic samples. The sponsors of this study are public or nonprofit organizations that had no role in gathering, analyzing or interpreting the data. We thank the clinicians and patients for their membership in and support of the International Registry of Recurrent and Familial HUS/TTP; a complete membership list appears in the Appendix. Supplemental information for this article is available online at http://www.cjasn.org/. Coordinators: G. Remuzzi, MD, P. Ruggenenti, MD (Clinical Research Center for Rare Diseases “Aldo e Cele Daccò,” Ranica, Bergamo, and Division of Nephrology and Dialysis, “Ospedali Riuniti” Azienda Ospedaliera, Bergamo), M. Noris, Chem. Pharm. D. (Clinical Research Center for Rare Diseases “Aldo e Cele Daccò,” Ranica, Bergamo). Investigators—Italy: M. Garozzo, MD (Division of Nephrology and Dialysis, “S. Marta e S. Venera” Hospital, Acireale, Catania); F. Casucci, MD, F. Cazzato, MD (Division of Nephrology, “Miulli” Hospital, Acquaviva delle Fonti, Bari); A. Ortensia, MD (Division of Nephrology, “SS. Antonio e Biagio e C. Arrigo” Hospital, Alessandria); I. M. Ratsch, MD (Pediatric Clinic, “G. Salesi” Hospital, Ancona); S. Alloatti, MD, V. Pellu, MD (Division of Nephrology and Dialysis, Ospedale Regionale, Aosta); G. Cesano, MD (Division of Nephrology, Ospedale Civile, Asti); G. Claudiani, MD (Division of Hematology, “S. Liberatore” Hospital, Atri, Teramo); W. De Simone, MD (Division of Nephrology and Dialysis, “S. Giuseppe Moscati” Hospital, Avellino); P. Dattolo, MD, F. Pizzarelli, MD (Division of Nephrology and Dialysis, “S. M. Annunziata” Hospital, Bagno a Ripoli, Firenze); R. Bellantuono, MD, T. De Palo, MD (Division of Nephrology and Dialysis, “Giovanni XXIII” Pediatric Hospital, Bari); M. Schiavoni, MD (Assistenza Emofilici e Coagulopatici, Ospedale Policlinico Consorziale, Bari); M. R. Caruso, MD, E. Gotti, MD, S. Rota, MD, A. Schieppati, MD (Division of Nephrology and Dialysis, “Ospedali Riuniti” Azienda Ospedaliera, Bergamo); T. Barbui, MD, A. Falanga, MD (Division of Hematology, “Ospedali Riuniti” Azienda Ospedaliera, Bergamo); P. Cornelli, MD, G. Torre, MD (Pediatric Department, “Ospedali Riuniti” Azienda Ospedaliera, Bergamo); R. Fumagalli, MD, I. Pelliccioli, MD (Pediatric Acute Care, “Ospedali Riuniti” Azienda Ospedaliera, Bergamo); I. M. Berto, MD (Division of Nephrology, “Ospedale degli Infermi”, Biella); P. Riegler, MD (Division of Nephrology and Hematology Service, Hospital of Bolzano, Bolzano); J. Mahlknecht, MD, M. Neunhauserer, MD, (Division of Pediatrics, Hospital of Brunico, Bolzano); E. Ragazzoni, MD (Division of Nephrology and Dialysis, Hospital of Borgomanero, Novara); A. M. Acquarolo, MD (II Rianimazione “Spedali Civili, Azienda Ospedaliera”, Brescia); O. Carli, MD, G. Gregorini, MD, S. Bove, MD (Division of Nephrology and Dialysis, “Spedali Civili, Azienda Ospedaliera”, Brescia); G. Rossi, MD (Division of Hematology, “Spedali Civili, Azienda Ospedaliera”, Brescia); A. Giangrande, MD (Division of Nephrology and Dialysis, Ospedale di Circolo, Busto Arsizio, Varese); P. Fonduli, MD (Pediatric Division, “G. Brotzu” Hospital, Cagliari); A. Bonadonna, MD, C. Gardin, MD (Division of Nephrology and Dialysis, Presidio Ospedaliero di Camposampiero, Padova); A. Mazzotta, MD (Division of Nephrology and Dialysis, “S. Spirito” Hospital, Casale Monferrato, Alessandria); G. Delfino, MD, E. Favaro, MD, R. Lazzarin, MD (Division of Nephrology and Dialysis, “S. Giacomo” Hospital, Castelfranco Veneto, Treviso); A. Granata, MD (Division of Nephrology and Dialysis, “Vittorio Emanuele II - Ferrarotto - S. Bambino” Hospitals, Catania); P. Pignataro, MD (Division of Medicine, “Vittorio Emanuele II - Ferrarotto - S. Bambino” Hospitals, Catania); S. Li Volti, MD, (Pediatric Department, Policlinico Hospital, Catania); M. Rocchietti, MD (Division of Nephrology and Dialysis, “Ospedale Civile, Ciriè, Torino); C. Castellino, MD (Division of Hematology, “Azienda Ospedaliera S. Croce e Carle”, Cuneo); L. Calacoci, MD (Division of Immunohematology, “S. Giovanni di Dio” Hospital, Firenze); C. Grimaldi, MD (Division of Internal Medicine and Nephrology, “S. Giovanni di Dio” Hospital, Firenze); I. Pela, MD, D. Seracini, MD (Division of Nephrology, “A. Meyer” Hospital, Firenze); R. Piperno, MD, M. Salvadori, MD (Division of Nephrology and Dialysis, “Careggi” Hospital, Firenze); E. Capussela, MD (Division of Hematology, “Ospedali Riuniti” di Foggia, Foggia); D. A. Procaccini, MD (Division of Nephrology and Dialysis, “Ospedali Riuniti” di Foggia); G. C. Barbano, MD, A. Canepa, MD, M. L. Degl'Innocenti, MD, G. Piaggio, MD, A. Trivelli, MD (Division of Nephrology, “G. Gaslini” Pediatric Institute, Genova); I. Fontana, MD (Transplant Center, “S. Martino” Hospital, Genova); D. Rolla, MD (Division of Nephrology, Dialysis and Transplantation, “S. Martino” Hospital, Genova); L. Morabito, MD (Division of Nephrology and Dialysis, Ospedale di Imperia, Imperia); S. D'Ardia, MD (Division of Immonohematology, Ivrea Hospital, Ivrea, Torino); V. La Milia, MD (Division of Nephrology and Dialysis, “A. Manzoni” Hospital, Lecco); C. Marseglia, MD (Service of Nephrology and Dialysis, “Carlo Poma” Hospital, Mantova); A. Bettinelli, MD (Pediatric Division, “S. Leopoldo Mandic” Hospital, Merate, Lecco); R. Chimenz, MD (Division of Pediatric Nephrology, “G. Martino” Hospital, Messina); G. Ardissino, MD, A. Edefonti, MD, C. Fredella, MD, F. Paglialonga, MD (Division of Pediatric Nephrology, Dialysis and Transplant, “De Marchi” Pediatric Clinic, Milano); A. Lattuada, BiolSciD., E. Rossi, MD (Division of Hematology, “L. Sacco” Hospital, Milano); V. Rossi, MD (Division of Hematology, “Niguarda Cà Granda” Hospital, Milano); V. Toschi, MD (Trasfusional Center, “San Carlo Borromeo” Hospital, Milano); Volpi A, MD (Division of Nephrology and Dialysis, San Paolo Hospital, Milano); M. Ballestri, MD, D. Bonucchi, MD, D. Davoli, MD, M. Leonelli, MD, E. Rubbiani, MD (Division of Nephrology, Dialysis and Transplant, Policlinico Hospital, Modena); D. Belotti, BiolSciD., E. Pogliani, MD (Division of Hematology and Transfusional Center, “S. Gerardo” Hospital, Monza, Milano); G. Masera, MD (Pediatric Department, “S. Gerardo” Hospital, Monza, Milano); T. Stellato, MD (Division of Nephrology, S. Gerardo“ Hospital, Monza, Milano); M. R. Iannuzzi, MD (Division of Nephrology, “A. Cardarelli” Hospital, Napoli); A. Ferretti, MD, C. Pecoraro, MD (Division of Nephrology, Children's Hospital “Santobono”, Napoli); G. B. Capasso, MD, S. Scognamiglio, MD (Chair of Nephrology, Second University of Napoli, Napoli); M. Bosa, MD, G. R. Cambrin, MD (Division of Internal Medicine-Hematology, “S. Luigi” Hospital, Orbassano, Torino); L. Murer, MD (Pediatric Division, Policlinico Hospital, Padova); L. Amico, MD (Division of Nephrology and Dialysis, “V. Cervello” Hospital, Palermo); A. Indovina, MD, R. Marcenò, MD (Division of Hematology, “V. Cervello” Hospital, Palermo); U. Rotolo, MD (Division of Nephrology and Dialysis, “Ospedale Civico e Benefratelli,” Palermo); T. Bertani, MD, P. Salis, MD (ISMETT, Palermo); U. Maggiore, MD (Division of Nephrology, Ospedale Maggiore, Parma); P. Noris, MD, C. Balduini, MD (Medical Clinic, “San Matteo” Hospital, Pavia); E. Trabassi, MD (Division of Nephrology and Dialysis, “San Massimo” Hospital, Penne, Pescara); G. Agnelli, MD, A. Blass, MD (Division of Internal Medicine, University of Perugia, Perugia); I. Capolsini, MD (Division of Hematology, University of Perugia, Perugia); P. Poisetti, MD (Division of Nephrology and Dialysis, Hospital of Piacenza, Piacenza); R. Caprioli, MD (Division of Nephrology and Dialysis, “S. Chiara” Hospital, Pisa); E. Nesti, MD (Division of Nephrology and Dialysis, “S. Miniato” Hospital, S. Miniato, Pisa); M. Tuccori, MD (Division of Farmacology, Azienda Ospedaliera Universitaria Pisana, Pisa); S. Aterini, MD (U. O. Nefrologia, Presidio Ospedaliero di Prato, Prato); G. Garozzo, MD (Trasfusional Center, “M. P. Arezzo” Hospital, Ragusa); E. Bresin, MD, E. Daina, MD, S. Gamba, RN, (Clinical Research Center for Rare Diseases “Aldo e Cele Daccò,” Ranica, Bergamo); M. Santostefano, MD (Division of Nephrology and Dialysis, “Santa Maria delle Croci” Hospital, Ravenna); G. Enia, MD, P. Finocchiaro, MD, C. Zoccali, MD (Division of Nephrology and Dialysis, “Bianchi, Melacrino, Morelli” Hospital, Reggio Calabria); V. Trapani Lombardo, MD (Division of Hematology, “Bianchi, Melacrino, Morelli” Hospital, Reggio Calabria); A. Amendola, MD, L. Dessanti, MD, F. Mandelli, MD, G. Meloni, MD (Department of Cellular Biotechnology and Hematology, “La Sapienza” University, Roma); F. Emma, MD, A. Gianviti, MD, S. Rinaldi, MD (Division of Nephrology and Dialysis, “Bambino Gesù” Pediatric Hospital, Roma); A. De Feo, MD, M. Ferrannini, MD (Rome American Hospital, Roma); A. Severino, MD (Division of Hematology, S. Camillo-Forlanini Hospital, Roma); T. Cicchetti, MD, G. Putortì, MD (Division of Nephrology and Dialysis, “N. Giannettasio” Hospital, Rossano Calabro, Cosenza); R. Paolini, MD (Medical Division, Rovigo Hospital, Rovigo); A. Pinto, MD (Division of Nephrology and Dialysis, “S. G. di Dio e Ruggi d'Aragona” Hospital, Salerno); A. Del Giudice, MD (Division of Nephrology, “Casa Sollievo delle Sofferenza” Hospital, S. Giovanni Rotondo, Foggia); P. R. Scalzulli, MD (Division of Hematology, “Casa Sollievo delle Sofferenza” Hospital, S. Giovanni Rotondo, Foggia); M. Sanna, MD (Division of Medical Pathology, Sassari Hospital, Sassari); A. Amore, MD, G. Conti, MD, R. Coppo, MD, L. Peruzzi, MD (Division of Nephrology and Dialysis, “Regina Margherita” Pediatric Hospital, Torino); O. Giacchino, MD, M. Milan, MD (Service of Immunohematology, “S. G. Bosco” Hospital, Torino); M. Borca, MD, C. Rollino, MD, A. Vallero, MD (Service of Nephrology and Dialysis, “S. G. Bosco” Hospital, Torino); L. Biancone, MD, L. Colla, MD, M. Messina, MD (Division of Nephrology and Dialysis, “S. G. Battista” Hospital, Torino); A. Khaled, MD, M. Mazzon, MD, C. Tognoli, MD (Division of Nephrology, “S. Chiara” Hospital, Trento); C. Cascone, MD, M. Dugo, MD, M. C. Maresca, MD, S. Mastrosimone, MD (Division of Nephrology and Dialysis, “S. Maria dei Battisti” Hospital, Treviso); M. Pennesi, MD (Division of Pediatric Nephrology, “Burlo Garofolo” Hospital, Trieste); E. Barbi, MD (Pediatric Clinic, “Burlo Garofolo” Hospital, Trieste); G. O. Panzetta, MD (Division of Nephrology and Dialysis, Hospital of Cattinara, Trieste); L. Campiotti, MD (Division of Internal Medicine, “Fondazione Macchi” Hospital, Varese); O. Amatruda, MD, G. Colussi, MD (Division of Nephrology, “Fondazione Macchi” Hospital, Varese); L. Funaro, MD (Division of Nephrology and Dialysis, “Presidio Ospedaliero”, Verbania); P. Bernich, MD, A. Lupo, MD (Division of Nephrology and Dialysis, “Borgo Trento” Hospital, Verona); L. Tavecchia, MD (Division of Hematology, “Borgo Roma” Hospital, Verona). Investigators—abroad: E. G. Bignasco, MD (Pediatric Nephrology, Posadas Hospital, Buenos Aires, Argentina); M. G. Caletti, MD, M. Adragua, MD (“Juan P. Garrahan” Hospital de Pediatria, Buenos Aires, Argentina); P. A. Coccia, MD, J. Ferraris, MD, G. Greloni, MD, R. Groppa, MD, N. Imperiali, MD, C. F. Varala, MD (Division of Nephrology, “Hospital Italiano de Buenos Aires,” Buenos Aires, Argentina); P. Hughes, MD (Nephrology Department, Royal Melbourne Hospital, Melbourne, Australia); R. S. Nanra, MD (Nephrology Department, John Hunter Hospital, Newcastle, NSW, Australia); P. Henning, MD, J. Nairn, PhD (Renal Unit, Women's and Children's Hospital, North Adelaide, Australia); J. Taper, MD (Nepean Cancer Centre, Penrith, Australia); R. Wens, MD (Clinique de Nephrologie-Dialyze, CHU Brugmann, Bruxelles, Belgium); D. Roussinov, MD (University Pediatric Hospital, Sofia, Bulgaria); M. Bitzan, MD (Pediatric Nephrology, McGill University and Montreal Children's Hospital, Montreal Quebec, Canada); G. Filler, MD, K. Blyth, RN (Children's Hospital of Eastern Ontario, Ottawa, Canada); M. Azocar, MD (Pediatric Nephrology, Hospital Luis Calvo Mackenna, Santiago, Chile); S. Moraga Nunez, MD (Pediatric Nephrology, Hospital of Coquimbo, Chile); E. Jančová, MD, R. Ryšavá, MD (Nephrology Unit, General Faculty Hospital, Praha, Czech Republic); T. Ring, MD (Department of Nephrology, Aaolborg Hospital, Aaolborg, Denmark); A. Traat, MD (Tartu University Clinics, Children's Hospital, Tartu, Estonia); C. Bührer, MD (Department of Neonatology, Charité Campus Virchow-Klinikum, Berlin, Germany); D. Müller, MD, U. Querfeld, MD (Department of Pediatric Nephrology, Charité, Berlin Germany); B. Hoppe, MD (University Children'Hospital, Cologne, Germany); C. V. Schnakenburg, MD (Department of Pediatrics, University Children's Hospital, Freiburg, Germany); M. J. Kemper, MD, F. Thaiss, MD (Universitätsklinikum Hamburg-Eppendorf, Hamburg, Germany); A. Lambert, MD (Division of Nephrology, University Hospital Mannheim, Germany); A. Schulze Everding, MD (Pediatrische Nephrologie, Universitätsklinikum Muenster, Germany); K. Mussig, MD (Medizinische Klinik II, Universitats Klinikum Tubingen, Germany); A. Kattamis, MD, V. Spolou, MD (“Agia Sophia” Children's Hospital, Athens University, Goudi Athens, Greece); P. Ziroyannis, MD (Nephrology Clinic, “G. Gennimatas” General Hospital, Athens, Greece); P. Y. J. Sim, MD (Department of Medicine and Geriatrics, Princess Margaret Hospital, Lai Chi Kok, Hong Kong); M. R. Ardalan, MD (Nephrology Department, Tabriz Medical University, Tabriz, Iran); D. Landau, MD (Division of Pediatric Nephrology, Soroka Medical Center, Beer-Sheba, Israel); C. Rinat, MD (Pediatric Nephrology Unit, Shaare Zedek Medical Center, Jerusalem, Israel); I. Krause, MD, O. Schiller, MD (Schneider Children's Medical Center, Petach-Tikvah, Israel); R. Rahamimov, MD (Trasnplantation Department, Beilinson Medical Center, Petach-Teqva, Israel); Z. Farfel, MD (Department of Medicine, Sheba Medical Center, Tel Hashomer, Israel); E. Matsukuma, MD (Department of Pediatrics, Nagoya Daini Red Cross Hospital, Nagoya, Japan); W. J. Wan Ismail, MD (Pediatric Department, Hospital Selayang, Selangor, Malaysia); J. Zachwieja, MD, M. Zaniew, MD (Department of Pediatric Nephrology and Dialysis, Poznan, Poland); P. Ponce, MD (Hospital “Garcia de Orta,” Almada, Portugal); J. Barbot, MD, M. Antunes., MD (Division of Hematology, “Maria Pia” Hospital, Porto, Portugal); M. S. Faria, MD (Depatment of Pediatric Nephrology, “Maria Pia” Hospital, Porto, Portugal); A. N. Lategann, MD (AMPATH Laboratories, Arcadia, Republic of South Africa); M. A. Albalwi, MD, A. Alswaid, MD (King Abdulaziz Medical City, Riyadh, Saudi Arabia); S. Al-Saadoun, MD, A. Manlangit, MD (Pediatric Nephrology, Riyadh Armed Forces Hospital, Saudi Arabia); R. Bogdanovic, MD (Department of Nephrology, Institute of Mother and Child Care of Serbia, Belgrade, Serbia); J. J. Verdu, MD (Medicina Trasfusional, Hospital General Universitario de Alicante, Spain); J. Luño Fernandez, MD (Department of Nephrology, Hospital General Universitario Gregorio Marañón, Madrid, Spain); H. Cano, MD, C. Martínez, MD (Centro Regional de Hemodonación, Murcia, Spain); A. Bock, MD (Nephrology, Kantonsspital Aarau, Switzerland); C. Rudin, MD (University Children's Hospital, Basel, Switzerland); F. Burkhalter, MD, M. Mayr, MD, M. J. Kim, MD (Transplantation, Immunology and Nephrology, University Hospital, Basel, Switzerland); N. Marangon, MD (Services de Nephrologie et de Transplantation, Hopitaux Universitaires de Geneve, Switzerland); S. Nef, MD, A. Schenk, MD, G. Spartà, MD (Nephrology Unit, University Children's Hospital, Zürich, Switzerland); B. Bergamin, MD, T. Fehr, MD (University Hospital, Zürich, Switzerland); E. Yilmaz Keskin, MD (Pediatric Hematology Unit, Gazi University, Ankara, Turkey); S. Unal, MD (Division of Pediatric Hematology, Hacettepe University, Ankara, Turkey); O. Al Masri, MD (Shaikh Khalifa Medical City, Abu Dhabi, United Arab Emirates); A. Sharma, MD (Royal Liverpool and Broadgreen University Hospitals, Liverpool, United Kingdom); D. Bockenhauer, MD (Great Ormond Street Hospital, London, United Kingdom); G. B. Haycock, MD (Pediatric Renal Unit, Guy's Hospital, London, United Kingdom); M. Ognjanovic, MD (Royal Victoria Infirmare, Newcastle upon Tyne, United Kingdom); H. Gallagher, MD (South West Thames Renal and Trasnplantation Unit, St. Helier Hospital, Surrey, United Kingdom); A. Katz, MD (Pediatric Nephrology, Children's Hospital, Birmingham, AL); J. Mittleman, MD (Cedars-Sinai Medical Center, Los Angeles, CA); S. Godfrey, MD (Kaiser Hospital, San Diego, CA); V. R. Dharnidharka, MD (University of Florida, Division of Pediatric Nephrology, Gainesville, FL); E. Chang, MD (St Luke's Mountain States Tumor Institute, Pediatric Hematology, Boise, ID); J. C. Lane, MD, C. B. Langman, MD (Division of Kidney Diseases, Children's Memorial Hospital, Chicago, IL); V. Kimonis, MD (Department of Pediatrics, SIU School of Medicine, Springfield, IL); L. Milner, MD (Division of Nephrology, Floating Hospital for Children, Boston, MA); R. Montgomery, MD (Johns Hopkins Hospital, Baltimore, MD); M. Hand, MD (Pediatric Nephrology, The Barbara Bush Children's Hospital at Maine Medical Center, ME); J. Steinke, MD (Pediatric Nephrology, Helen DeVos Children's Hospital and Clinics, Grand Rapids, MI); C. E. Kashtan (Pediatrics, University of Minnesota Medical School, Minneapolis); L. Najera, MD, J. Steinke, MD (Pediatric Nephrology, Fairview University Medical Center, Minneapolis); D. Milliner, MD (Mayo Clinic, Rochester, MN); B. Warady, MD (Children's Mercy Hospital, KS City, MO); M. Ferris, MD, D. Bunch, PhD (Division of Nephrology and Hypertension, University of North Carolina, Chapel Hill, NC); P. Lane, MD, L. Wrenshall, MD (Nebraska Medical Center, Omaha, NE); K. Lieberman, MD (Pediatric Nephrology, Hackensack University Medical Center, Hackensack, NJ); R. Wallerstein, MD (Genetics Department, Hackensack University Medical Center, Hackensack, NJ); S. Gurkan, MD (Robert Wood Johnson Medical School, NB, NJ); R. Tapia, MD (Division of Pediatric Nephrology, The Children's Hospital at Albany Medical Center, Albany, NY); J. Listman, MD (SUNY Upstate Medical University, Syracuse, NY); S. B. Conley, MD (Department of Nephrology, St. Christopher's Hospital for Children, Philadelphia); A. K. Feng, MD (Pediatric Critical Care, Hasbro Children's Hospital, Providence, RI); M. G. Seikaly, MD (Pediatric Nephrology, Children's Medical Center, Dallas, TX); R. Raafat, MD (Pediatric Nephrology, Children's Hospital of the King's Daughters, Norfolk, VA); J. C. Barrett, MD (Division of Hematology-Oncology, VA Commonwealth University, Richmond, VA); V. Chadha, MD (VCU Medical Center, Pediatric Nephrology, Richmond, VA); J. Felgenhauer, MD (Pediatric Oncology Center, Sacred Heart Children's Hospital, Spokane, WA); J. Gitomer, MD (Department of Nephrology, Marshfield Clinic, Marshfield, WI). Laboratory analysis: F. Gaspari, ChemD (Clinical Research Center for Rare Diseases “Aldo e Cele Daccò,” Ranica, Bergamo); C. Ottomano, MD, A. Vernocchi, MD (Division of Laboratory Analysis, “Ospedali Riuniti” Azienda Ospedaliera Bergamo). Biochemical and genetic studies: P. Bettinaglio, BiolSciD, J. Caprioli, BiolSciD, D. Cugini, BiolSciD, R. Donadelli, BiolSciD, C. Mele, BiolSciD, C. Mossali, BioTechD, G. Pianetti, Chemist (Clinical Research Center for Rare Diseases “Aldo e Cele Daccò,” Ranica, Bergamo); M. Galbusera, BiolSciD, S. Gastoldi, Chemist, D. Macconi, BiolSciD (“M. Negri” Institute for Pharmacologic Research, Bergamo, Italy); P. F. Zipfel, MD (Hans Knoell Institute for Natural Products Research, Jena, Germany). Statistical analysis: A. Perna, StatSciD (Clinical Research Center for Rare Diseases “Aldo e Cele Daccò,” Ranica, Bergamo). Complement Factor B Mutations in Atypical Hemolytic Uremic Syndrome--Disease-Relevant or Benign? Atypical hemolytic uremic syndrome: what is it, how is it diagnosed, and how is it treated?